This middle school lesson plan blends a classroom experiment with the interactive PhET simulation Masses and Springs. Students design and conduct an experiment to test their predictions about the behavior of springs with masses attached. The simulation is used to explore kinetic and potential energy of spring motion and to visualize how the spring moves on different planets with varied gravitational constants. The lesson provides extensive background information for both educators and learners along with scripted teacher discussion. The simulation required to complete this activity is available from PhET at: Masses & Springs Simulation. 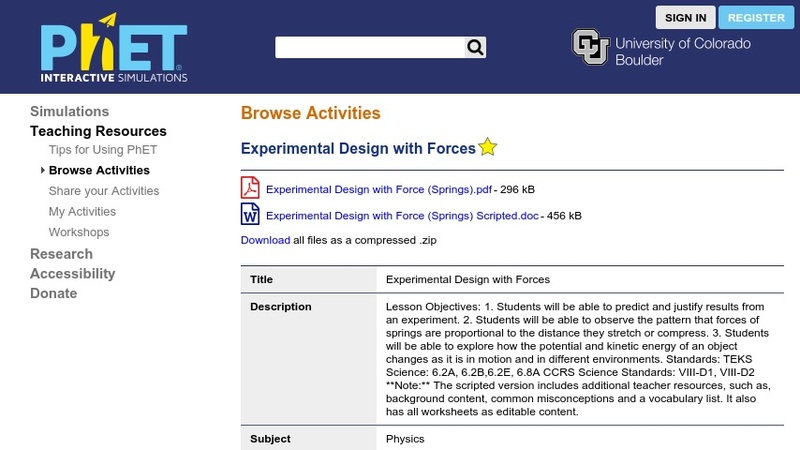 This lesson is part of the PhET (Physics Education Technology Project), a large collection of free interactive science simulations.